Looking for a new and exciting take on the old boring pizza crust? Better yet looking for a pizza crust that you won’t feel guilty about eating. I have great news for you! This Chicken Pizza Crust is the perfect high protein swap for your everyday crust. Did I mention its gluten-free, and can be made for those of you on the Paleo diet? My friend Adam told me about this idea he saw online for a low-carb crust and I just had to give it a try. 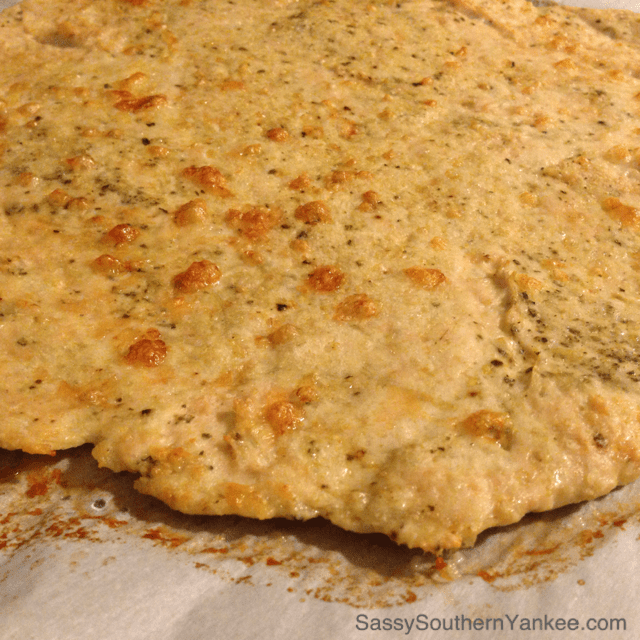 Its super easy and delicious way better than that cauliflower crust and 10 times better than those cardboard gluten-free crusts. I made my pizza into a BBQ chicken pizza on chicken crust, but you could always make it whatever way you want. I’ve made it using everything for a margarita pizza, taco pizza, anyway you slice it chicken pizza crust is where it’s at! Sauce and toppings of your choice. I used BBQ sauce, Cheddar Cheese, Bacon and Red onion. 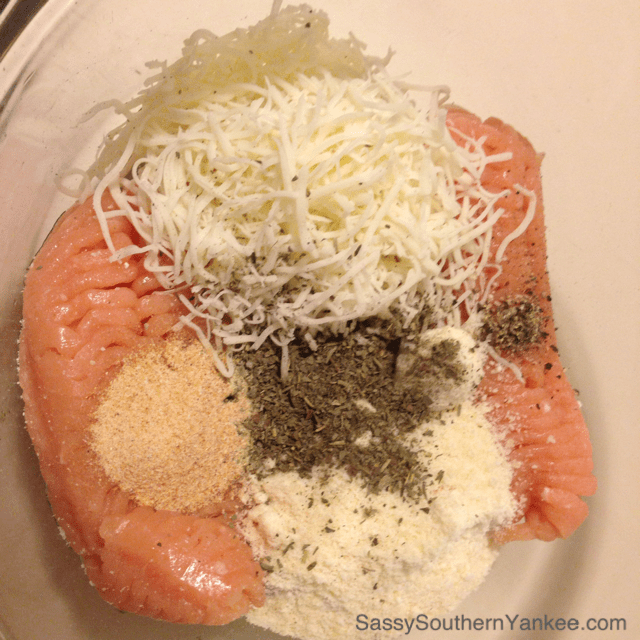 In a medium bowl combine the ground chicken, cheeses and spices. Line your pizza pan or cookie sheet with parchment paper sprayed with non-stick cooking spray. Place the ground chicken mixture onto the pizza pan. Then Place a piece of parchment paper or plastic wrap on top of the chicken mixture. Evenly press the mixture into the pizza pan. If you want you can even use your rolling-pin to get it nice and even. Remove the parchment/plastic wrap once done. Bake in the oven for 20 min or until the crust is golden. If you like this recipe you might like our Turkey Crust Pizza Margherita Style it’s low-carb and high in protein! place whatever sauce, toppings and cheese you like on the chicken crust then return to the oven to bake for an additional 10 min until the cheese and toppings are melted heavenly goodness. 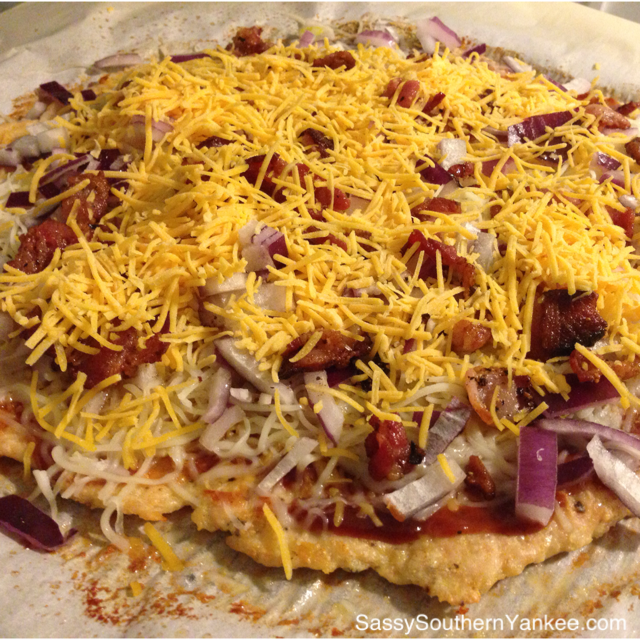 This entry was posted in Main Course and tagged BBQ Chicken, BBQ Chicken Pizza, Cheese, Chicken, Chicken Crust, Crust, Gluten Free, Low Carb, Paleo, Pizza, Pizza Crust. So glad I came across this recipe. I cannot wait to make this next week. After hearing how good it turned out from a few other people I’m excited to try!! CheleLynn~ Let me know what you think once you’ve had a chance to try it! just made this tonite for dinner!!excellent! !making it for a lunch on Friday also!!! Wonderful Robin! I’m so glad you enjoyed it! Made this pizza tonight and the family loved it. Only thing was is all the chicken grease that was on the top of crust. I dumped it off 3x. Then the bottom was a bit oily also. I made mine with turkey pepperoni, sliced ham and onions. Thx for the recipe it was delicious. Do you need to use parchment paper under it? Also my pizza never browned like the top of yours. I’m so glad you enjoyed the recipe! I like my crust browned, so I did end up flipping the crust over once it was done baking and then top the browned bottom side with the toppings. That allowed the “top” to brown on the bottom for the last bit of the baking. I also didn’t have any issues with the chicken being greasy, and I’m surprised you did. You might want to check with your butcher/grocer and make sure they are only using the chicken breast in the ground chicken and not adding any of the skin. Ground turkey would be a great alternative which should eliminate the grease problem as well. 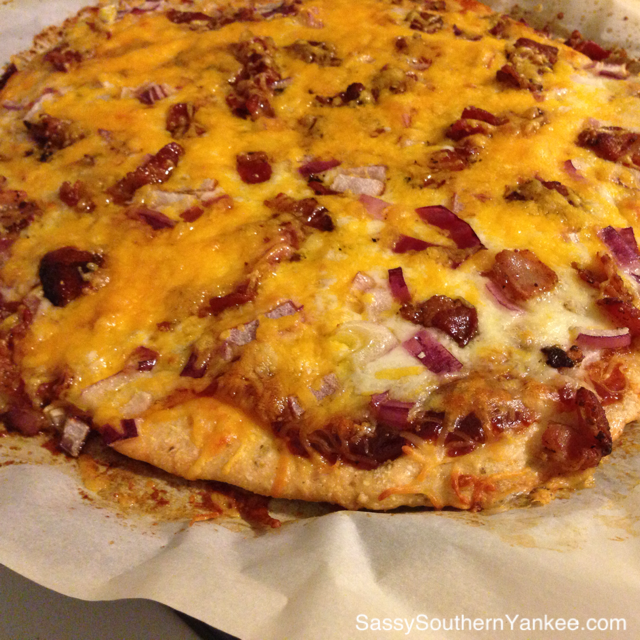 I love your variation with the ham, turkey pepperonis and onions sounds delish! Hi again Angela! I just used parchment paper because I hate to scrub the pizza pan 🙂 I’m sure you can use foil paper or just place it directly on the pan. I hope you have a wonderful week! Thanks for your feedback and questions! I am so trying this!!! Had gastric bypass….I love pizza, but the crust does not like me!! This sounds so good! This was so awesome, I had it twice last week with veggies on it and another day made into a Hawaiian pizza! Today for Super bowl Sunday, I can enjoy pizza on my low carb plan. The picture shows bread crumbs but nothing in the recipe about that. I did it without and it was good. Good Evening George! The recipe doesn’t call for bread crumbs because there aren’t any in the recipe. The picture shows mozzarella cheese, parmesan cheese and garlic powder (which I added for the Italian seasoning, included in the recipe). I’m glad you enjoyed the pizza! We made this last night. OMG it is fantastic. I may never eat a regular pizza ever again! We thinly sliced some tomato and mixed it up with some EVOO, fresh garlic and seasonings. We put the ground chicken mixture on parchment paper, sprayed the chicken with a light coating of fat free cooking spray and then baked it for 30 mins. I think the cooking spray helped to brown it a bit. Once we removed it from the oven, we topped it with the thin tomato slices, placed several small dollops of low fat ricotta and then some low fat mozzarella. Baked that for 10 mins and it came out AMAZING! We plan to try it this weekend with different toppings. Perhaps some goat cheese, figs, and drizzled with a balsamic reduction! thanks for an amazing recipe! I just made this tonight for dinner, I also had a grease problem but this crust tasted excellent! I topped with mozzarella cheese and and pepperoni. I’m so happy I found this because I am trying to lower my carb intake. Thank you so much for sharing this amazing pizza crust! I had a major grease problem!! Made this for the second time and it was amazing again! No grease, but I had to cook it about 10 minutes longer than the directions say. This time I made 2 pizzas and it’s the 2nd one I have to tell you about. I made a homemade alfredo sauce with butter, half and half and parm cheese, used that with bacon and spinach as topping with a little moz and it was AMAZING! Bacon Spinach Alfredo Chicken Crust Pizza! It was yummy. I made a pepperoni pizza. thanks for the recipe. I had no.problem with grease. How many servings or pizzas does this make? Mine was the size of a large pizza, so about 8 to 10 servings. It all depends on how flat you make the chicken crust. I hope you enjoy the pizza! Made this tonight and it was amazing!!! I will be using this recipe for my gluten free/low-carb pizza from now on. Thank you for a great recipe!!! Thank you, Michelle! I’m glad you enjoyed it! We have are chicken ground when boneless chicken is on sale. we also have some made into chicken sausage and am looking forward to trying this very soon. I made this for supper tonight and it was delicious. As a diabetic I need to watch my carbs so this was perfect for me. Will be making this again soon. So glad to find such great recipes! ! Thanks, Michele! I appreciate your kind words. Let me know if there are any recipes/diet restrictions your interested in and I would be happy to create them for you! I substituted chicken for 1.5 lbs ground turkey. Top it with red, green, yellow peppers, black olives, ground beef, sausage chunks, onion and turkey pepperoni. Hands down the best pizza I’ve ever eaten! This and your chicken fajita casserole are two of the greatest dishes I’ve cooked. Thank you so much for the wonderful recipes! Awe! Thank you Travis for your kind words. I’m glad that you like the recipes! I actually made it with ground turkey a few months back and loved it! Thank you again for your support and if there are ever any recipes you want me to perfect in the test kitchen let me know! How did you work with the chicken as it is so sticky. It kept sticking to hands, parchment paper, am I missing something? Did others experience the same thing? The mixture is quite sticky like frosting. You can always put a bit of oil/pam on your hands prior to working with the mixture or if you aren’t concerned about the carbs you can pat your hands with a bit of GF flour or Corn starch. I just use my hands and scrap off. I hope this helps! Does this get thin and crispy? Or does it stay soft? Hi Kim! Sorry for the delay. The crust doesn’t really get crispy but if you make it think enough it might get a bit firmer. You could always increase the cheese amount and that should help it crispy up maybe using a hard cheese like parmesan cheese. I hope this helps answer your question. This recepie was fantastic! Thanks for sharing. Will definitely be having this one again! This was soooo good!!! I loved it and so did my 8 year old nephew! Thank you for sharing the recipe! So glad you liked it Jaclyn! I want to try. but I need to know how many oz are in a serving? I’m only allowed 8oz a meal. The Chicken Pizza Crust is 5 oz per serving (uncooked) without the toppings (4 servings per pizza). Depending on how much sauce, cheese and additional toppings your use would depend on the final final weight. I would suggest that you weigh the cooked pizza to see the final weight using a small food scale. I found one at my local grocery store for a reasonable price. Love this, easy and delish! I made a spinach and broccoli version! Thank you thank you! This is my go to for pizza from now on. I had bariatric surgery a year ago and have stayed away from pizza other than just eating the toppings once in awhile. I made this pizza today and it was fantastic! I made the crust very thin and I’m glad that I did because well it’s like eating a chicken burger when you think about the actual thickness. Made this with my seven year old daughter over the weekend and it was amazing. She loved it and I loved having cold, guiltless pizza for breakfast the next morning! We will continue this as out Saturday night tradition! Once the pizza is cooked can the final product be handle in my hand like a piece of pizza? Omgosh. I followed the recipe using pork bulk sausage, cause that was what I had, a few more seasonings such as onion and garlic powder, cooked, drained grease, used paper towels to pat grease off top. Used SPAGHETTI sauce because that is what I had, sharp shredded cheddar, jalapenos, olives and pepperoni, omgosh. I would have posted a pic if I could but truly,,it did not last that long. Delicious. Thank you. Glynis that sounds delicious!! I will have to give it a try! I especially love the jalapeños with olives and pepperoni! Pretty tasty! A little dry but definitely and excellent alternative to gluten/carbs. Much quicker than waiting for regular dough to rise too. Would definitely make again and recommends to friends. Hi. Do you by any chance know the carb count in this? This recipe was delicious!! Came out great!! This recipe was so good!! I agree with the greasy part while cooking the chicken, but there were two kind of chicken ground 1 was chicken breast ground and 1 was chicken ground. the chicken i used with chicken ground and it was moist. I put made mine with fresh mozzarella, pepp,red onions, fresh mushroom, canadian bacon, and black olives and jalapenos.!! I will do this again this week!! I was skeptical at first, but ill try different recipes. I’m a pizza lover but stop eating so much because trying to eat healthier. This pizza was awesome. The chicken crust was not greasy at all. I would add some garlic salt to give a taste. It was kinda bland without. I would recommend all my pizza lovers to try. Can you cook this on a pizza stone? Hi Leslie! I don’t see why not, but I haven’t tried. I would consult the companies website for the stone to see if you can place poultry on it. do you know the calorie count? I am also watching my calorie intake. Hi Jennifer! I don’t know the calorie count but I bet you could put the recipe into my fitness pal. I would do it for you but I’m in the process of moving homes. I used turkey instead of chicken. It shrank quite a bit so next time I’ll use 2 lbs instead of one. My husband can eat the whole thing. I will have to be fast to get a slice. 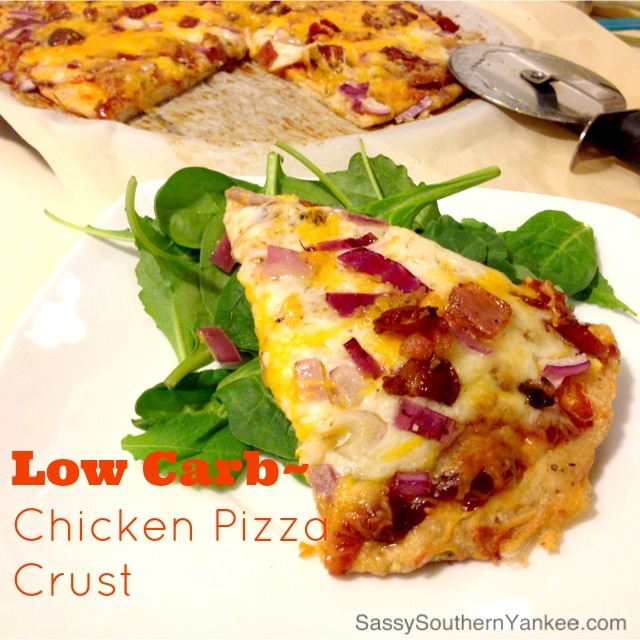 Ok a friend of mine made this chicken crust pizza and shared it on BGGST well I really like pizza when everyone else in my household is eating it I want to to… I really can’t do the bread, so when I seen this I was like yes! I brought ground chicken from BJS mozzarella cheese and some Mexican cheese, I sautéed my veggies just for like 5 mins. I used 35 slices of turkey Pepperoni. I used spaghetti sauce because I didn’t have pizza sauce (it’s raining here in DC and I wasn’t going out) Chile this pizza is so amazingly good… it made 8 slices I ate one was trying to get 2 down… that wasn’t happening! Sisters you really must try.. add whatever you like! I did red and green peppers, white onion, mushrooms, turkey pepperoni and 2 cheeses. Next time imma try buffalo chicken breast and these ingredients maybe add jalapeños and spinach. Y’all must try… you can also use ground turkey. Maybe bulk chicken sausage… I’ll play around with it! Yummy! S/n I did keep in oven longer than recipe suggested. I came across this recipe by mistake but I’m so glad that I did. I cooked my ground chicken crust a little longer than the recipe called for. I topped mines with Alfredo sauce, sauteed onions, banana peppers and spinach. It was delicious. I can’t wait to try different toppings on this crust. I made this tonight and it came out really well. I found it shrank quite a bit, but my ground chicken was probably not of the highest quality… lol. Cook times were perfect. Was not a ton of effort (definitely easier than the cauliflower crust). I just added sauce and veggies and it great. My husband kept trying to steal some (I made them regular pizza from scratch!). Just made this tonight and it was fabulous! Have not been a fan of cauliflower crust. This is awesome. I’m very excited to have found something that actually taste good. I made the barbecue, red onion, bacon and cheese. But, have been sitting here talking about all the combination that would be good. I’m thinking white sauce, ham, Swiss cheese, for Courdon blue. Yummy! This chicken crust pizza is amazing! I’m super picky about food, but I love this!! I love the name of your blog. First time here. I am a Northerner From Southern Illinois now living in Florida. I will definitely make this again. I baked it for 15 min, there was a lot of water so I drained it, flipped it over and put it back in the oven for 5 more min. I didn’t look crispy enough for me so I turned the broiler on for 5 min on each side. I topped it with crushed tomatoes for a sauce then bacon, pepperoni, red bell pepper, black olives and mozzarella cheese. My hubby and son even liked it. I am just trying this for the first time. It’s in the oven now and I’m practically drooling already. Didn’t have high hopes, but hubby and I are both on high protein diets (also, he’s gluten free). Have to say we were both pleasantly surprised!!! Flipped the crust over 1/2 way through for a better browning effect, and topped it with bbq sauce, cheese and onions. Yummy!!!! I have a Betty Crocker Pizza maker – wonder if this would work in that for at least part of it? I didn’t have any ground chicken so just pounded a couple of chicken breast very thin and made the rest like your recipe. It was very good! I made this tonight. And HOLY SMOKES!!! THIS IS PHENOMENAL!!!! I may never buy a pizza again! I topped mine with pizza sauce, mozzarella cheese, mild cheddar, turkey pepperoni slices, and onions. I LOVE IT!!!! It made 10 slices. Each slice was 121 calories, 12g protein, and only 1.2g carbs! That’s outstanding!!! Thank you for this. Question. Could you cut the cheese from the crust and use egg instead? I try not to overdo it on the cheese. (My stomach also doesn’t handle too much dairy well). I saw a recipe with the canned chicken white meat well drained of course. Have you tried that?? Reviews were very good. How much egg do you use if you make it with egg instead of cheese? Can you make a bunch of crusts ahead of time and freeze them? I’ve got this crust in the oven now (I used pizza stone and parchment paper) and there’s a moat of liquid around it. It’s not looking good. Hope it can be salvaged. Hey I’m trying this with ground turkey due to the store not having ground chicken and I was not running to another store. I’m getting some of the same results as others on here with a lot of grease and not getting crispy at all. I’ve had it in there for roughly 30 mins and have drained the grease couple of times. I flipped it to see if that does anything and baked it a little longer. Either way I’m going to eat it but seeing if there was another way to get it crispy. I would say 1 to 2 eggs just enough to help bind it together. Hey Lois, I haven’t tried the canned chicken but if you do I would love to know what you think! Ooh I’m totally going to do that next time!! I just tried this recipe and I didn’t even have time to take a picture we scarfed it up so fast! I didn’t have a grease problem, although I will flip it halfway through next time to get it more crispy on both sides. It was very delicious as prepared, but the bottom wasn’t as crispy as the top. Still a 10/10 recipe!! I made mine caprese with basil and my boyfriend is *still* telling me how much he likes it an hour later. I just made this using bbq sauce and onion. I work in a pizza shop. They have nothing on this. It was fantastic! I hope this Works! Making this right now… but just looked closer at the picture.. I used shredded parmessan… not the grated stuff… which is looks like what was used in your pic.. It looks like it’s just going to be a flat chicken meatloaf..lol.. I’ll update later to let you know how it goes!.. hahah! Well, Just finished it and it was definitely tasty!.. but is also was not “pizza crust” by any means and tasted like a flat chicken meat load.. I will definitely try again, but use grated parmessan next time… Thank you for the recipe! Used chicken, Onions and bbq sauce and cheese as toppings..
Just tried it and love it!! I used boneless skinless chicken breast. Cut it in pieces and froze then used my food processor. My daughter had ordered the frozen ones which are pricey. So I decided to try it myself. My friend can’t have cheese. It there anything else she can use as a binder besides the cheese? You could try and egg or egg white to help with the binding or there is dairy free cheese at the store (haven’t tried it) but that might work too! So far so good. Used turkey meat. It was a bit wet so stopped up extra water. But crust browned up just fine. This is a great treat when dieting. Could the crust be frozen for later? Also BBQ sauce is not low carb its always loaded with sugar and corn syrup. I made this about a week ago. I had no trouble at all with the grease issue. I also tripled the recipe and made about ten medium sized pizza crusts. I wrapped and froze eight of the raw crusts, and cooked the other two. They turned out amazing! You can hold the slices like a regular pizza slice. This morning I cooked one of the frozen crusts, topped with scrambled eggs, bacon, and cheese. Perfect breakfast pizza!!! Thanks for such a great recipe. The pizza was sooo good. It big hit I’m my house. I can’t seem to find the nutritional facts tho. Can someone shed light on cals., fat,. Protein, and carbs? Thank you. I calculated the Macros of the crust if anyone is interested for Keto. I don’t pay attention to types of fat, sodium or cholesterol so I didn’t calculate them. I just looked at the store for the lowest carb sauce and used it sparingly. BBQ sauce is a hard one to find low carb. You could try using a bbq rub instead of the sauce to obtain the flavor without increasing the carb count. I just really like a bit of sauce on my pizza. You sure can! Others have done this and said it works great. I personally have not tried it. I made this last night. I wouldn’t say it was great but it was way better than the egg and mozzarella ones or the cauliflower shells. It was easy to eat by hand and didn’t add too much flavor to the pizza. The next time I won’t add much in herbs. It’s really the sauce and topping that make the difference. While I probably will never go back to my homemade dough I probably will sacrifice some carbs to a pizza using a flour taco shell. A large 10” tortilla has 28 g net carbs. 1/4 of it or 2 slices will have 7 grams plus one or two from the toppings. Well worth it to me for a more normal pizza. Am I off base? Some people eat to live but I live to eat! I am trying to find foods on this Keto regimen that will satisfy and satiate me. If it doesn’t taste great I’d rather have anoth fat bomb and a cup of tea. Hi, so excited to find this and will be trying tonight!! You said a few times in the comments to let you know if there are any recipes we’d like you to come up with. Since this is a great make-at-home variation of the (good, but expensive) Real Food chicken-crust pizza… wondering if you might consider tackling the RF Chicken crust tortilla enchiladas. If ONLY we could make a chicken crust tortilla…think of all the options! lol. thought I’d toss it out there for your consideration 🙂 Thanks again for sharing this recipe. will check back in after I’ve made it. I found a link to this recipe in the comments section of another low carb pizza crust recipe. I want to try this IMMEDIATELY. Imagine, getting to have pizza more than once a week with no guilt! I made this last night and all 4 of us loved it and know it will be made again! I baked it, topped it with pizza sauce, chorizo, home made bacon and a little more cheese. Cooked it then topped it with fresh serrano ham and olive oil and vinegar dressed rocket (arugula). I wish I could post you my photo-it looked as good as it tasted! Just made this for my husband for dinner… he loved it! Made a small pizza with no carbs. Didn’t have Italian seasoning so I improvised and used 1/4 tsp. garlic powder and 1/4 tsp. Longhorn steakhouse seasoning. He had pizza sauce, mozzarella, and Turkey pepperoni on it. Will be making this again! Thanks! I so enjoyed the pizza. I made it last week and yesterday. I’ll make it again today. Since my dear brother ate his share and mine! I added red bell pepper, green onions mushrooms, a couple of chopped bok choy and chard leaves. Today, I think I’ll add anchovies. The first time I prepared I used turkey. With the chicken I had to pour off water. I will have the butcher ground a couple of chicken breast and see if the water is eliminated. I like to prepare my crust mixture and refrigerate for few hours or overnight. This is delicious and very easy. I like it better than most of the low carb crusts I have tried. I am making this tonight with low carb Alfredo sauce, bacon, pineapple and salami/prosciutto. Can’t wait, it sounds and smells delicious. Made this crust tonight using ground turkey, and 1/2 C each of the cheeses. Also added some basil & a little salt. It did produce some liquid, but that cooked off by the time it was done. Having a severe tomato allergy, I used a pesto for “sauce”, Italian sausage, kalamata olives, sliced sweet onion & more mozzarella. TASTE WAS WONDERFUL! LOVED IT. Finally, pizza again after 3 years! Made this for dinner tonight and my husband and I loved it! Do you think you could freeze the crust after it’s baked? I want to make 3 small crusts and we’ll eat 2 at dinner and use the other one later. Yes! We have frozen them in the past and just thawed them prior to adding the toppings. They turned out great! Has anyone prepared the crust ahead of time then frozen it for later use? Curious if anyone has tried it with ground beef 90% lean? In this awful weather and the fact that I live a half hour winding drive along a river to get there, I just thought it might be fun to try since that is all I have. I’would just love to do the recipes for the pizzas as in our house we just love pizzas.and was just wondering if you could freeze.the pizzas once cooked.as we really want to start making and meal prepping for later.or quick meals or lunches for later in the month.